Lychee荔枝 ลิ้นจี่ Litchi chinensis Sapindaceae don't eat the seeds. Limit eating of fruit in one sitting especially in malnourished children. 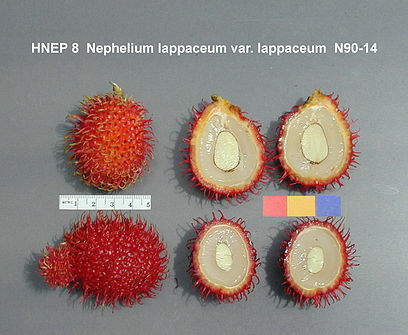 Nephelium xerospermoides เงาะไม่มีขน Very similar to Rambutan . In Thai the name means "Rambutan without fur." Longan 龙眼 ลำไย Dimocarpus longan The Thai might mean "body hair" I am not sure. Pulasan Nephelium mutabile ngoh-khonsan Looks like Rambutan, but no hair. Guarana Paullinia cupana, syn. P. crysan, P. sorbilis contains caffeine, theophilline, theobromine, . This fruit has not been determined to be generally considered safe as food, although it is used as a suppliment in the US and in sodas in Brazil.